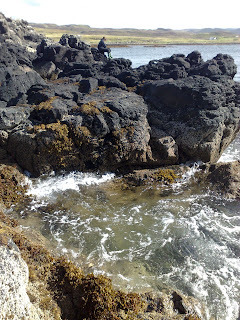 We caught half a dozen nice mackerel spinning off the rocks as the tide came in, and still made it back before the causeway was cut off - just! Oops! We were on the Anton near Stockbridge and had been fishing for all of 10 minutes when I heard a heard a bit of a squeal from upstream. 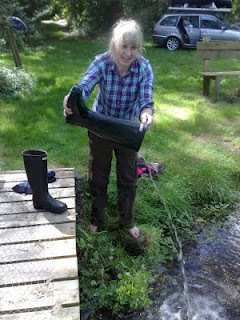 Emma had stepped off a fishing platform into the mud and reeds, and gone in to her waist! 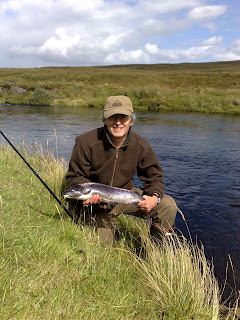 Luckily we had some spare clothing and wellies, but the fish were in a sulk all day and weren't the slightest bit interested in our flies. Eventually we gave up and drove into Stockbridge to visit the excellent Robinson's butchers - where I was served by James Quinn who featured on the cover of our January 2004 issue! Amazingly, he told me that you can't buy Sporting Shooter in Stockbridge - there's only one newsagent, and they have some misguided 'ethical' policy about not stocking 'gun magazines'. We didn't leave empty handed - no fish, but a big bag of Robinson's delicious pork sausages! 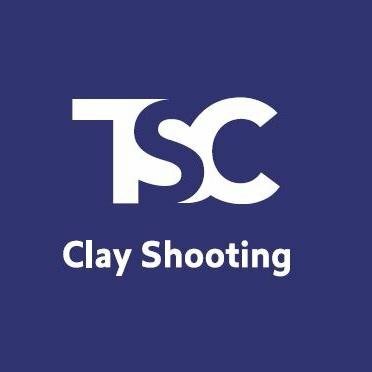 Check out this superb launch programme from www.fieldsportschannel.tv - go to their website for the full range of programmes (my browser struggled with the full version, if you have problems try their Youtube channel instead). Is the BBC institutionally anti-shooting? 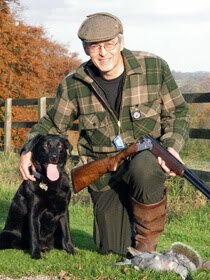 BASC's Phil Pugh did an excellent job of explaining the benefits of shooting to a rather hostile sounding Anna Hill on BBC Radio 4's Farming Today programme yesterday. 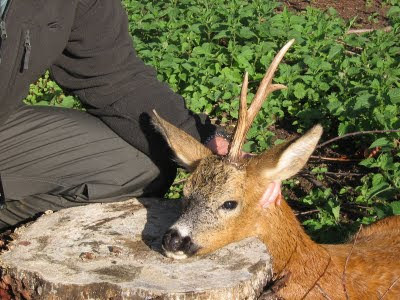 In today's programme (12 Aug), Anna went deerstalking in Suffolk. She appears to be getting it, slowly, although she still asked a few rather odd-sounding questions: "Can it become addictive to some people," she asks, as if she finds it hard to believe that deerstalkers aren't all blood-crazed psychopaths. When it comes to shooting, the programme always gives the impression it's terrified of guns and finds shooting rather unsavoury. An odd perspective for a programme aimed at the farming community. Last week's report about stolen shotguns being used in crime was a case in point where Anna Hill was practically standing on her chair going "Eek! A gun!" 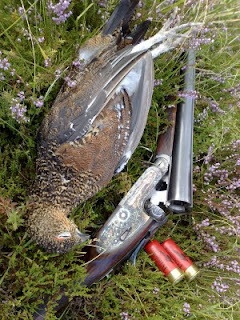 She's come a long way in a few days - I suspect BASC's press office may have been hard at work behind the scenes. This perfectly illustrates the problem shooting has with the media generally, and the BBC in particular. 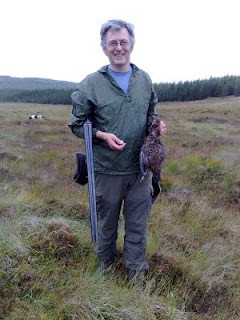 Robin Page made some very anti-BBC comments at the CLA Game Fair debate 'The BBC and the countryside: friend or foe?' He sees anti-fieldsports and anti-farmer conspiracies behind every pot-plant. He was very amusing, but I think he's wrong. Many journalists come from an urban middle-class background. These people rarely encounter shooting, except the sort that goes on between rival drug gangs. They can't imagine why anyone would want to 'kill things for fun'. And that attitude comes through when they report shooting. There's another problem fieldsports have with the BBC in particular, and that's the word 'controversial'. BBC culture says that if something is controversial, they must report it impartially. In other words, let both sides of the argument have their say. This is set out in the organisation's charter. Watching the BBC Countryfile programme on the CLA Game Fair, it was clear that the programme makers considered that shooting and fishing were not controversial. They could cover both with no need to find an anti for 'balance'. But hunting was 'controversial', so to cover their backsides against complaints, they went the 'impartiality' route and dragged in the awful Louise Robertson from LACS to bleat about 'cruelty', thereby 'balancing' the fact they had shown a few hounds in the main arena. Who decides if something is 'controversial'? So far as I can tell, the programme's producers decide for themselves. And in that sense, the BBC is simply holding up a mirror to public opinion, rather than pursuing any agenda of its own. Unfortunately, by giving a handful of vociferous antis a platform, this policy ensures that some subjects continue to be 'controversial', even though 99.9% of the general public never give them a moment's thought. And it ensures that those same people never become sufficiently well informed to form a valid opinion. A reader, who wants to remain anonymous, sent in this amazing photo of a single-antlered roebuck he shot at the end of July in Norfolk. He comments that there was not even a rudimentary right pedicle, and only the slightest of bumps could be felt under the skin. The head is now with a taxidermist to be mounted. DEFRA, fondly known in these parts as the Department for the Elimination of Farming and Rural Affairs, is making a big noise about its new consultation on 'Food Security'. My immediate reaction was to think 'well, my food supply is secure thanks very much: I've got a 12-bore'. But this is too big a subject for flip answers. Yes, I'm deeply suspicious of DEFRA. After FMD, Single Payments, bTB and the rest, it's hard to avoid getting the impression that DEFRA was created to wipe out British farming. But the debate sparked by the DEFRA consultation is long overdue. Britain used to have a farming industry to be proud of. Generations of farmers held their heads high, producing wholesome healthy food in ways that were efficient, sustainable and beneficial to biodiversity and the environment (words few people had ever heard of back then, they just knew what was right). We bred some of the best livestock in the world, grew the best crops, and fed the country while the U-Boats prowled the seas. 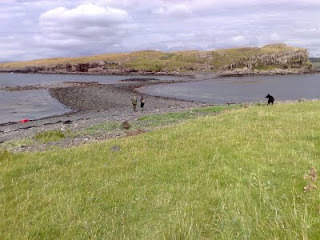 Oh, and we had some pretty amazing wildlife, with no help from the likes of EN, animal rights fanatics or the RSPB. Since the end of WWII, the wheels have come off. Farming is just another business run for maximum short-term profit (often as not the supermarket's rather than the farmer's), with the added complication that UK and European government just can't keep its controlling, social-engineering fingers off. Add to that the general urban view that the countryside belongs to them, and should be run as some sort of oversized municipal park for the benefit of ramblers and birdwatchers, and you end up with the dog's breakfast we have today. Huge sections of our once-proud farming industry are in terminal decline: dairy, upland sheep & beef... Rural village life in any meaningful sense is gone. Reversing the trend will be hugely complicated. It's about much more than food (and why is the government so obsessed with the word 'security'?). A good starting point would be the Countryside Alliance Rural Manifesto, which has been studiously ignored by the BBC as well as by the government and others. The DEFRA consultation will, of course, be seized on by every lobbyist and pressure group as a way to push their own agendas. Proponents of GM, supermarkets, vegetarians and others have jumped on the bandwagon. Well guess what - Sporting Shooter readers already have the answer. I'm thinking of a handful of people in particular. They live on, off, and in harmony with the land. They are smallholders in the oldfashioned sense. They grow their own veg, keep a few cattle, sheep, hens and pigs. The muck goes on the fields, waste food goes in the pigs and chickens. They heat their houses with carbon-neutral timber from local woodlands. 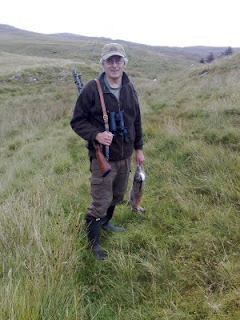 They shoot and eat a few deer, rabbits, pheasants, pigeon and wildfowl. These are the people DEFRA, Europe and New Labour have done their best to wipe out - yet they've proved remarkably resilient. When the oil runs out, they'll be well-fed, warm, and laughing. And they'll have guns. Now that's security. Coursing is legal - with a cheetah! Check out this story (with video) in today's Sunday Times. OK, so it's as much publicity stunt as it is real life, but it does show up the Hunting Act as a complete dog's breakfast. And it provided another opportunity for LACS's Louise Robertson to sound like a whiny pointless idiot: "The link between teaching an animal to hunt and the eventual release of captive-bred animals into the wild is extremely tenuous" she says. Perhaps she'd rather teach predators to say "One veggie burger and a packet of organic muesli please." This rewilding lark isn't as simple as the eco-evangelists would like to believe. The wildlife just refuses to play by the rules. In a story worthy of Midsomer Murders, some of Scotland's famous reintroduced beavers have gone missing, amid reports of mysterious gunshots heard in the woods. The project staff seem to have lost track of the beavers altogether. Despite knowing they might stray and 'monitoring them closely', they now admit 'Field staff and volunteers have been working around the clock in an effort to track the missing beavers'. Let's hope they've become a bit better at it before they're allowed to play with lynx, wolf and bear. It seems an old dog can learn new tricks. Yesterday I went over to Ian Colclough's Weybridge Guns & Tackle to buy a handful of gold-head nymphs. As you do, I ended up spending a small fortune on a new reel and line. Ian helpfully offered to put the backing and line on for me, then showed me a trick that's so obvious I can't believe I hadn't heard it before. When you first strip the line of the reel and start fishing, it lands in tight spring-like coils at your feet. After an hour or two, the line has relaxed a bit, making it much easier to handle and less likely to tangle. The answer: tuck the rod under your arm and give the line a bit of a stretch. Starting at one end, take hold of a yard or so of line between your hands and give it a gentle tug, feeling the natural stretch in the line. Move the line along and do the same with the next yard, and the next, until you reach the end. Look down at your feet, and there's the line lying in gentle curves, not those tight coils. Now there's no excuse for not making the perfect cast! Another tip Ian gave me: that stretch is the mark of a healthy fly line. When it loses its stretch, it's time to buy a new one. Ian's advice reminded me why I still visit my local gun & tackle shop, rather than scrabbling round the internet for the lowest possible price. Police are appealing for witnesses following the theft of 500 Pheasants from an address in the Dunstall Area of Burton-upon-Trent, Staffordshire. Also at the time of the theft a large amount of damage was caused to Crops situated in fields near to the premises. Anyone who may have seen anything suspicous, witnessed anything or with any other information is asked to contact PC 0904 Richard Lymer at Uttoxeter Police Station on 0300 123 44 55 or Crimestoppers on 0800 555 111.